Don´t miss the farewell gig + EP release at Trägårn in Borås 12/6. 090525: We can guarantee an amazing night... and the new recording (damn! ), probably the best songs we´ve ever written. Therefore it feels really good to quit when you are on top, and not because of lack of inspiration. Another great band playing this evening are "The Bad Buddah Gang". Depressive Art goes separate ways as friends! 090408: After six years together we have come to the conclusion to take a break and take a very, very, very... long vacation. A few days ago two of the original members Joakim and Sanjin decided to leave the band, sad but true. We have shared many great moments together and are extremely proud of everything we have accomplished and would like to keep it that way. Later on this spring we will release a final EP on our website FOR FREE. This is probably the best material we have ever recorded. We are looking forward to make the minitour in Lattvia + a few extra gigs that will be announced on our website later on. Since it would feel kind of strange to continue playing under the name Depressive Art without Joakim and Sanjin, will Klas, Christian and Torbjörn found a new band with musicians from the Borås area called "The fantastic people". This band will be an upgrade version to Depressive Art 2.0, but with new guitarists and drummer. Joakim and Sanjin will continue with the band Lucy (www.lucy.nu), great pop in Swedish, and Marcus is currently looking for a new band. Klas, Christian, Torbjörn, Joakim, Sanjin & Marcus. Download a great 60s sounding, garage rock album... for FREE! We want everyone to discover our music! 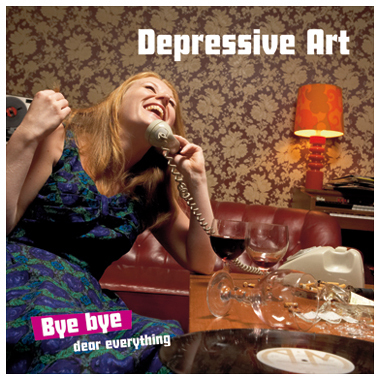 Now we release the complete album "Bye bye, Dear Everything" (10 songs) as downloads for free. This is a great opportunity for new listeners who surf by depressiveart.com, maybe we´ve got the music you need? If you happen to like the album don´t forget to sign up for our newsletter... and HEY, if you want the real thing, CDs are available. » Go to discography for mp3s. For Free! » I want the whole album as a zip-file. For Free! If you want information about Depressive Art in your mail when something new comes up you should sign up for our newsletter. 090402: We can now confirm a minitour in Lattvia. We will play three gigs in Riga, and it´s going to be awesome. 090122: Jamendo has made an article about the band. Check it out! New gig at Swing/Borås 5/12. 080825: Depressive Art are proud to open for the Satans Finest:-) – GRAVEYARD. This evening will be a retro evening with early 70s and late 60s music. Another really cool band playing are the Ginger Trees from Borås. Listen to these great bands! Two new gigs in September! 080818: Depressive Art are booked at two venues this fall! For these gigs we hope to try some new material for our coming release. Pluto, Ulricehamn (26/9) and Sticky Fingers, Gothenburg (27/9). 080505: The 28:th of june Depressive Art will play at Myckleby Musikfestival on the beautiful island Orust! New gig at Garaget, Avesta 3/5! 080418: Depressive Art are booked to the amazing venue Garaget in Avesta 3/5. And we promise, "garage" rock it will be! 080523: Depressive Art will play at Kulturfestivalen in Borås. The gig take place at Sandvallsplats nearby the river. On stage at: 20.00. More gig dates TBA! 080304: Recently our video for the single "On Solid Ground" was featured in a contest at famecast.com. We reached the top 25 out of many, many bands = Really Good. Big thanks to those who voted for us! Cheers! First gig for Summer of Love - 2008 is confirmed! 080130: Depressive Art will play at Nabben Festival 26/7. More gig dates TBA! 080130: At the moment we are looking for festival gigs with hopes for a busy schedule this summer! For contact: bookings@depressiveart.com or visit contact page. 071126: Wonderland Records + Faktum have released a CD to support the homeless in Gothenburg. All profit goes directly to Faktums work for the homeless in Gothenburg. The CD includes Depressive Art and other Wonderland- acts as well as bands on small labels and also unsigned acts. The CD can be bought for a mere 70 SEK (8 Euro) at CD- Centralen in Gothenburg or from the Wonderland Records webshop. Last gig of the year  Sticky Fingers, GBG 29/12! 071102: It feels great to be back at Sticky Fingers / Gothenburg, 29/12. Last time we played at Sticky, top-floor was sold out! Next gig at Snövit / Stockholm - 26/10! 071002: This evening we will play a melancholic acoustic set. Another great band playing this evening are Sneezing Habit. Depressive Art opening act for "The Oh No Ono"! 070814: See you at Pustervik/Gothenburg 13/9! 070801: Depressive Art are proud to play at Kontiki (Gothenburg) 18/8 to end this summer of love. 070801: Amazing reviews from Musiklandet and Gefle Dagblad. Live Review - Arvika Festivalen! 070801: Mikael Mjörnberg has written a great review about the gig. New Drummer ­ Marcus Carter! 070620: Finaly we have found the right man behind the drums. More info about this amazing guy comming soon! Dear Everything - Music video! 070313: On the night of the release, Klas was interviewed by Daniel Arosenius from Joyzine.se. 070311: The album "Bye bye, dear everything" has been reviewed by Metal Heart. 070304: Prepare for a night with Depressive Art the 13th of April! New gig and new reviews! 070301: Depressive Art are opening for Cirkus Miramar at Rockborgen, Borås, the 17th of March. Also, new reviews from Borås Tidning, MusikLivet and Skrutt Fanzine. 070219: We´re very satisfied with how the realease party turned out, and we´d like to thank everyone who attended! The event was recorded on film and depending on the quality, parts of it may become available. 070216: Tomorrow´s the big night! 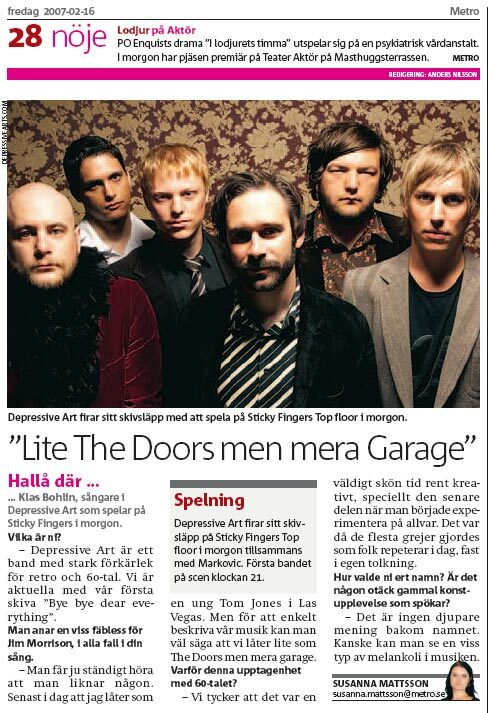 Depressive Art has been interviewed by Borås Tidning, Metro and Göteborgs-Posten (GP 070217). On Solid Ground - Music video released! 070212: Depressive Art are happy to announce that their first music video is released. We are very satisfied with the results and like to give a BIG THANKS to everyone involved!